Here I am sharing some of the facts and benefits and even risks of eating a yummy tempting watermelon! Watermelon is a vine-like flowering plant originally from southern Africa. It is a large, sprawling annual plant with coarse, hairy pinnately-lobed leaves and white to yellow flowers. It is grown for its edible fruit. The fruit has a smooth hard rind, usually green with dark green stripes or yellow spots, and a juicy, sweet interior flesh, usually deep red to pink, but sometimes orange, yellow, or white, with many seeds. I know this sounds much of science but basically watermelon is what we all know-a fruit and even a vegetable. 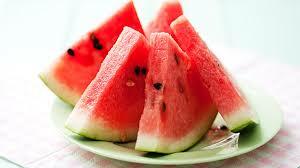 watermelon is more than 91 percent water. It has more lycopene than raw tomatoes. The watermelon can be classed as both a fruit and a vegetable. It is a fruit because it grows from a seed, has a sweet refreshing flavor, and is loosely considered a type of melon (although it is actually a type of berry called a pepo). It is a vegetable because it is a member of the same family as the cucumber, pumpkin and squash. It is also harvested and cleared from fields like other vine growing vegetables. It contains vitamins A, B6 and C, lots of lycopene, antioxidants and amino acids. Watermelon fruit is a good source of potassium; Potassium is an important component of cell and body fluids that helps controlling heart rate and blood pressure. It, thus, offers protection against stroke and coronary heart diseases. The juice may relieve muscle soreness. Eating watermelon on a hot summer day is a tasty way to help you stay hydrated and avoid. One of several minerals found in watermelon seeds is magnesium. A handful of watermelon seeds contains about 0.29 mg of iron which is an important component of hemoglobin — carrying oxygen through the body. It also helps your body convert calories into energy. Its rind,also known as the citrulline might give your workout a boost. Citrulline might improve your next athletic performance as well. It Can Reduce Your Blood Pressure. If your doctor instructed you to lower your blood pressure, try eating watermelon — rind and all. Some research has shown that watermelon extract supplements are able to help obese adults control their blood pressure. These were some of the many facts and benefits and ricks whatever u name it of a very tempting fruit and even a vegetable called the watermelon!